#12-13 "Hustlers, Beats, and Others" (left) is the classic study of deviant behavior by renowned sociologist Ned Polsky. Poolrooms and their hustlers, beats and jazz musicians are just some of the diverse subjects expertly woven together in this groundbreaking work. 1998 edition, 265 pages. about 5 inches wide and 8 inches tall. Condition as new. $600. 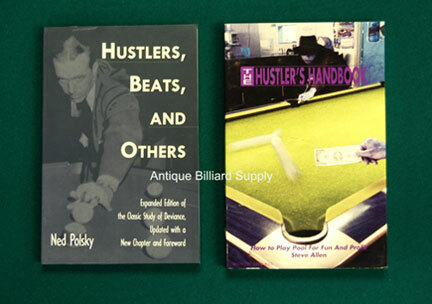 "The Hustler's Handbook" by Steve Allen (right) is the manual of how to play pool for fun and for profit. This rare copy of the out-of-print book contains chapters on slumps, choking and intimidation. 268 pages, about 5 inches wide and 8 inches tall. Condition as new. $200.